Four computers donated by Fluor-BWXT Portsmouth will be installed in the computer lab at the 14th Street Community Center in Portsmouth. From left, Yvette Jordan (14th Center), Deneen Revel (FBP), Roxanna Ferguson, Maxine Malone and Evan Fisher. In addition to the computer lab, the 14th Street Community Center offers a library (pictured), study room, workout room, gymnasium, art room and a full kitchen. What may seem like an ordinary neighborhood in Portsmouth is actually home to a center filled with educational opportunities and activities for both children and adults. Thanks to regular BINGO games, occasional donations, and a staff of mostly volunteers, the 14th Street Community Center is able to offer a variety of resources to the public at no cost. On Dec. 12, Fluor-BWXT donated four Lenovo “ThinkStation” computers to beef up their computer lab. Fluor-BWXT is the primary cleanup contractor for the U.S. Dept. of Energy at the DOE Portsmouth Site in Piketon. The 14th Street Community Center, which has been open for more than a decade, helps keep kids off the streets so they can improve their potential by learning valuable skills. Evan Fisher is a board member at the community center. “If we’re going to keep them off drugs, this is the front line in Portsmouth,” Fisher said. Mary Nelson has worked at the center for several years. “Dr. John Valentine is the vice president of our board. When he taught at Shawnee State, he used to send students from his community involvement course to the center to volunteer—they’re still coming,” Fisher said. In addition to computer classes, parenting classes, pottery classes and violin lessons, the center offers an athletic program (i.e., basketball for grades K-6), and is often able to provide meals or snacks. One of the center’s new endeavors is putting together a GED program. Volunteer Director Maxine Malone is one of the GED coordinators. Malone said the GED initiative is part of a collaborative effort with the Port 45 Recovery Center, in Portsmouth, which is a drug/alcohol rehabilitation center. Parent Volunteer Yvette Jordan shares her first-hand take on why the center is so crucial to the community. “I was brought up in this center. They learn how to cook, sew, do pottery, and I help make sure the kids are minding (we have some kids who need authority),” Jordan said. Jordan values the center so much that she brings her grandchildren to the facility to learn and interact. Jordan was a drug addict for 28 years and has been clean for 13 years. She now works at the Counseling Center, Inc., in Portsmouth, and in her spare time, coaches the “Drug-Free Drill Team” for the 14th Street Community Center. “What’s amazing is what these folks do on a shoestring—on half a shoestring,” Fisher said. Peggy Davis, director of Business Services at FBP, expressed her support. In addition to these computers, FBP donated $3,500 to the center in 2016 to help them purchase some computer systems through the Community Commitment Fund. The center’s BINGO fundraiser is held at the 17th Street Learning Center on Wednesdays and Fridays from 4-10 p.m. For more information about the community center, please call 740-353-7801; donations can be mailed to 14th Street Community Center, P.O. Box 765, Portsmouth OH 45662. Port45 Recovery can be reached at 740-529-7356 or by email at mmalone@port45.com. 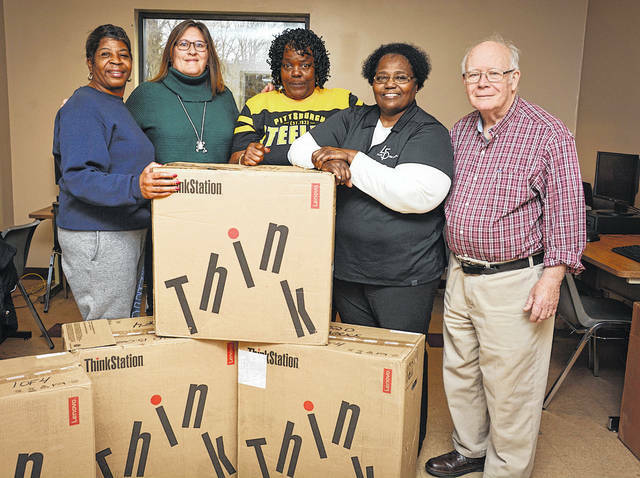 https://www.portsmouth-dailytimes.com/wp-content/uploads/sites/28/2018/02/web1_FBP-14th-Center_Group-photo.jpgFour computers donated by Fluor-BWXT Portsmouth will be installed in the computer lab at the 14th Street Community Center in Portsmouth. From left, Yvette Jordan (14th Center), Deneen Revel (FBP), Roxanna Ferguson, Maxine Malone and Evan Fisher. 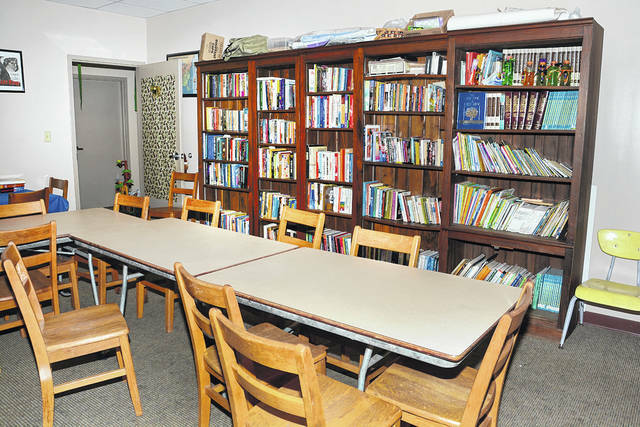 https://www.portsmouth-dailytimes.com/wp-content/uploads/sites/28/2018/02/web1_FBP-14th-Center_library.jpgIn addition to the computer lab, the 14th Street Community Center offers a library (pictured), study room, workout room, gymnasium, art room and a full kitchen. Fluor Corporation (NYSE: FLR) and BWX Technologies, Inc. (BWXT) (NYSE: BWXT), two world-class companies with significant Ohio experience, formed Fluor-BWXT Portsmouth LLC (FBP) to address the decontamination and decommissioning (D&D) needs at the Department of Energy’s (DOE) Portsmouth Site in Pike County, Ohio. CH2M, another global leader in industrial and environmental projects, provides support. Fluor-BWXT employs 1,900 workers who bring unparalleled experience, insights, and lessons learned from across the DOE complex. The Fluor-BWXT Portsmouth mandate is to clean up the Portsmouth Site safely and compliantly, provide strong uranium stewardship and partner with local communities to achieve a sustainable economic future. For more information, visit www.fbportsmouth.com.